VATICAN CITY (CNS) — Devotion to divine mercy spurred an Austrian cardinal to correspond with a death row inmate in Texas; Cardinal Christoph Schonborn of Vienna said he was shocked at the idea that Richard Masterson could be put to death Jan. 20. 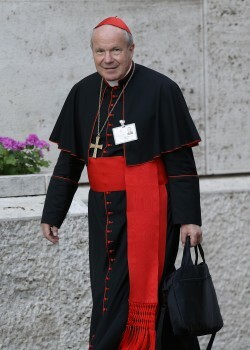 “It’s frightening,” Cardinal Schonborn said at a Vatican news conference Jan. 18. He added that Pope Francis has been informed of the scheduled execution. Cardinal Schonborn, president of the executive council of the World Apostolic Congress on Mercy, said that true devotion to divine mercy forms one’s spiritual life, but also impacts one’s family life, commitments in society and personal activity. “The apostolate of mercy is not just devotion, but charity — mercy in action,” he said. Visiting prisoners is a traditional work of mercy and the cardinal’s personal contact with Masterson is a symbolic expression of that. Masterson, 43, was sentenced to death in 2002 for the murder a year earlier of a female impersonator. The cardinal was at the Vatican to unveil plans for the European Apostolic Congress on Mercy at the Vatican March 31-April 4 and for the World Apostolic Congress on Mercy in Manila, Philippines, Jan. 16-20, 2017. The reception of migrants and refugees and the ways they are integrated into European society, the cardinal said, will be a primary concern at the European congress, which will culminate with Pope Francis’ Mass for the feast of Divine Mercy. “We must not forget that Europe lived with blood and tears for centuries because of wars between Christians,” he said. “Now, facing the challenge — and it’s a big challenge — of migrants and refugees there is a risk” that an increasing number of European countries will close their borders and not just temporarily as several have done over the past six months. “The Iron Curtain exists again; in a different way, but it exists,” he said. NEXT: Teaching on theology of the body unifies Christians, American says in U.K.